When the irrepressible nun-turned-nanny Maria taught the Von Trapp children to sing, she began with “Doe, a deer, a female deer, Ray, a drop of golden sun.” Or so Richard Rodgers and Oscar Hammerstein portrayed it in their 1959 musical, The Sound of Music. Do, re, mi is just one of several ways of naming notes (generically called sol-feg or solfeggio) to help singers learn a song rapidly, or even sing it at first sight. This system had its origins in a medieval monastery, where an Italian monk (rather than an Austrian nun) was teaching boys to sing. The monk's name was Guido d'Arezzo (born between 990 and 999), and he is one of the musical geniuses of the Middle Ages. Guido was educated at the Benedictine monastery at Pomposa near Ferrara, and like church choir directors everywhere, he had to turn musically illiterate people into singers who could lead worship. At Pomposa, he gained a reputation for teaching chants to the singers in record time. He and his friend, Brother Michael, compiled a book of musical responses (or antiphons) for monastic worship using a new system of notation. The chants of Guido's time usually stayed within that six-note range, but a few went further, and so he allowed for a note below (which he designated by the Greek letter gamma). And thus the range of notes became known by their first two syllables, gamma + ut, or gamut. That explains why today, when you “run the gamut,” you move through the entire range of something. While at Pomposa, Guido also devised a system of lines on which to write the notes. Before Guido, musicians wrote notes between the lines of text indicating by their position whether a melody went up or down on a given syllable. But how far up? How far down? That was difficult to tell. So Guido wrote the notes on lines or in the spaces between them. Guido's practical creativity earned him admiration from other monastic houses in Italy, but jealousy and envy in his own monastery. Perhaps because of the bad feelings of his fellow monks, Guido left Pomposa and moved to Arezzo, where he wrote a book to help train the singers at the cathedral there. His innovative ideas caught the attention of the pope, who summoned him to Rome to teach the pope's clergy his methods. Guido's reputation and innovations have endured, providing the foundation for almost all music since then. But how did ut, re, mi become do, re, mi? Once the syllables became completely independent of their original hymn, some unknown Italian of the 17th century thought do sounded better than ut. And he was right. 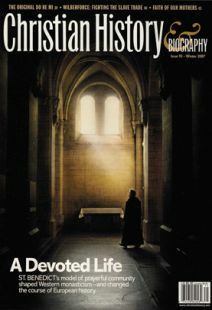 David Neff is the executive editor of Christian History & Biography and editor of Christianity Today. As music director at his church, he understands Guido's challenge to teach music quickly. After a crushing political defeat, William Wilberforce nearly gave up his fight to abolish the slave trade. But a life-changing letter from John Newton sent this Daniel back into the lion's den.